The Chamber of Petroleum Consumers [COPEC], has said it will embark on a demonstration on Wednesday over what it describes as the persistent increase in the prices of petroleum products. According to the Chamber, the demonstration, which is in collaboration with the Industrial and Commercial Workers Union (ICU), is to force government to further reduce taxes on petroleum products. Consumers have had to pay more at the pumps for a better part of 2017, and in January 2018, prices went up due to rise in oil prices, and the cedi’s marginal depreciation. Currently, a litre of both petrol and diesel, go for 4 cedis 62 pesewas at some major fuel stations. This is despite assurances from the National Petroleum Authority (NPA) that prices will remain fairly stable at the pumps. Speaking to Citi News, the Executive Director of COPEC, Duncan Amoah, called on government to review prices of petroleum products. The Institute of Energy Security (IES), had earlier predicted that prices of fuel may go up by 2 percent in the first pricing window in February, between February 2, 2018 and February 15, 2018. The IES further attributed the development to the constant rise in crude oil prices which is currently selling at 69 dollars per barrel on the international market, among other factors. “Crude oil prices have gone up on the international market and it is still rising; as we speak the cost of a barrel of oil is averaging around 69 dollars from a previous average of 67.7 dollars. That’s a rise of about 2 percent. 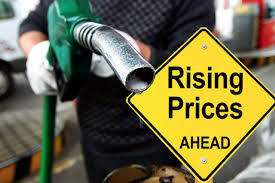 The finished product that’s gasoline and gas oil prices have also gone up on the international market,” Principal Research Analyst at the IES, Richmond Rockson had told Citi Business News in an interview.